This application protocol describes a complete workflow for reliable and efficient mouse TH cell differentiation, starting with single-cell preparation, followed by isolation of naïve CD4+ T cells and in vitro activation and differentiation, through to comprehensive cell analysis. We demonstrate that in vitro TH cell differentiation in the presence of TexMACS™ Medium leads to a higher expression level of the characteristic effector cytokines in the various TH subsets compared to RPMI 1640. ▲ Note: Depending on the cell number to be cultivated and differentiated per well, 6-, 12-, 24- or 48-well plates might be used. Please refer to the protocol to choose the appropriate cell culture dish. Prepare a solution of PBS, pH 7.2, 2mM EDTA and 0.5% BSA by diluting MACS® BSA Stock Solution 1:20 with autoMACS® Rinsing Solution. For details on the use of the gentleMACS™ Dissociators, refer to the gentleMACS Dissociator user manuals. For cell culture experiments subsequent to tissue dissociation, all steps should be performed under sterile conditions. The weight of one mouse spleen amounts to 80–120 mg (female BALB/c mouse, 6–7 weeks old). Close C Tube tightly and attach it upside down onto the sleeve of the gentleMACS Dissociator. ▲ Note: Close C Tube tightly beyond the first resistance. ▲ Note: Ensure that the sample material is located in the area of the rotor/stator. After termination of the program, detach C Tube from the gentleMACS Dissociator. (Optional) Perform a short centrifugation step to collect the sample material at the bottom of the tube. Resuspend sample and apply the cell suspension to a Pre-Separation Filter, 30 μm, placed on a 15 mL tube (1–2 mouse spleens per C Tube) or to an appropriate cell strainer placed on a 50 mL tube (3–6 mouse spleens per C Tube). ▲ Note: Dissociated tissue can be removed from the closed C Tube by pipetting through the septum-sealed opening in the center of the cap of the C Tube. Use ART® 1000 REACH™ 1000 μL pipette tips. Wash Pre-Separation Filter with 5 mL of PBE buffer. Discard Pre-Separation Filter and centrifuge cell suspension at 300×g for 10 minutes at room temperature. Aspirate supernatant completely. Resuspend cells in PBE buffer to the required volume for further applications. For example, resuspend cells in 10 mL buffer for magnetic labeling. Prepare cells and determine cell number. Centrifuge cell suspension at 300×g for 10 minutes. Aspirate supernatant completely. Resuspend cell pellet in 400 µL of PBE buffer per 1×10⁸ total cells. Add 100 µL of Biotin-Antibody Cocktail per 1×10⁸ total cells. Mix well and incubate for 5 minutes in the refrigerator (2−8 °C). Add 200 µL of PBE buffer per 1×10⁸ total cells. Add 200 µL of Anti-Biotin MicroBeads per 1×10⁸ total cells. Add 100 µL of CD44 MicroBeads per 1×10⁸ total cells. Mix well and incubate for 10 minutes in the refrigerator (2−8 °C). (Optional) For highest recovery, wash cells by adding 1–2 mL of PBE buffer per 1×10⁸ total cells and centrifuge at 300×g for 10 minutes. Aspirate supernatant completely. Resuspend up to 1×10⁸ cells in 500 µL of PBE Buffer. Always wait until the column reservoir is empty before proceeding to the next step. Choose an LS Column and a suitable MACS® Separator. Place LS Column in the magnetic field of a suitable MACS Separator. For details refer to the respective MACS Column data sheet. Prepare column by rinsing with 3 mL of PBE buffer. Apply cell suspension onto the column. 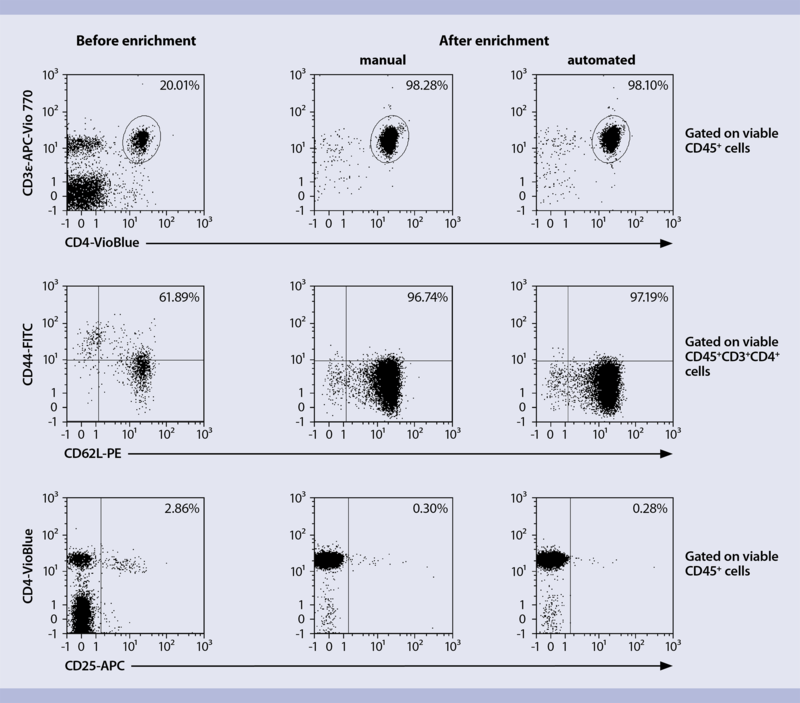 Collect flow-through containing unlabeled cells, representing the enriched naïve CD4+ T cells. Wash column with 3 mL of PBE buffer. Collect unlabeled cells that pass through, representing the enriched naïve CD4+ T cells, and combine with the effluent from step 3. ▲ Note: (Optional) If flow cytometry analysis of the freshly isolated naïve CD4+ T cells is desired, take an aliquot (up to 1×106 cells) and proceed to "Flow cytometry analysis of freshly isolated naïve CD4+ T cells". (Optional) Remove column from the separator and place it on a suitable collection tube. Pipette 5 mL of PBE buffer onto the column. Immediately flush out the magnetically labeled non-naive CD4+ T cells by firmly pushing the plunger into the column. The recommended antibody dilution for labeling of cells and subsequent analysis by flow cytometry is 1:10 for up to 1×106 cells/50 µL of buffer. Volumes given below are for up to 1×106 nucleated cells. When working with fewer than 1×106 cells, use the same volumes as indicated. When working with higher cell numbers, scale up all reagent volumes and total volumes accordingly (e.g., for 2×106 nucleated cells, use twice the volume of all indicated reagent volumes and total volumes). Resuspend up to 1×106 nucleated cells per 25 µL of PBE buffer. Wash cells by adding 1−2 mL of PBE buffer and centrifuge at 300×g for 10 minutes. Aspirate supernatant completely. Resuspend cell pellet in a suitable amount of PBE buffer (e.g. 500 µl) for analysis by flow cytometry or fluorescence microscopy. ▲ Note: Add propidium iodide to a final concentration of 1 µl per mL (e.g., 0.5 µl in 500 µl) to the cell suspension, if exclusion of dead cells via fluorescence is desired. TexMACS™ medium supplemented with FBS (final concentration 10%), 2-mercaptoethanol (final concentration 0.01 mM) and 100× penicillin/streptomycin stock solution (final concentration 1%). Medium referred to as fully supplemented T cell medium (see "Polarization of naïve T cells") consists of supplemented T cell medium (TexMACS including 10% FBS, 0.01 nM 2-mercaptoethanol and 1% penicillin/streptomycin stock solution) with the addition of cytokines and antibodies from the CytoBoxes. Addition of penicillin/streptomycin to the T cell media is optional. Resuspend Anti-Biotin MACSiBead Particles thoroughly by vortexing before use, to obtain a homogenous suspension. Anti-Biotin MACSiBead Particles are supplied without preservative. Remove aliquots under aseptic conditions. It is recommended to load Anti-Biotin MACSiBead Particles in batches of 1×10⁸ Anti-Biotin MACSiBead Particles. Loaded Anti-Biotin MACSiBead Particles are stable for up to 4 months when stored at 2–8 °C. Pipette 100 μL of CD3ε-Biotin and 100 μL CD28-Biotin into a sealable 2 mL tube and mix well. ▲ Note: This antibody combination, with a final antibody concentration of 10 μg antibody per 1 mL loaded Anti-Biotin MACSiBead Particles, is optimized for achieving maximum T cell activation. Add 300 μL of buffer and mix well. Resuspend Anti-Biotin MACSiBead Particles thoroughly by vortexing. Remove 500 μL Anti-Biotin MACSiBead Particles (1×10⁸ Anti-Biotin MACSiBead Particles) and add to antibody mix. ▲ Note: Anti-Biotin MACSiBead Particles can be loaded in a flexible manner with biotinylated antibodies or ligands other than those supplied. If desired, add other biotinylated antibodies or ligands at appropriate concentrations and adjust with buffer to a total volume of 1 mL accordingly. Incubate for 2 hours at 2–8 °C under constant, gentle rotation by using the MACSmix™ Tube Rotator at approximately 4 rpm (slowest permanent run program). The loaded Anti-Biotin MACSiBead Particles (1×10⁸ Anti-Biotin MACSiBead Particles/mL) are now ready to use. Do not remove the loaded Anti-Biotin MACSiBead Particles from the antibody mix. Store at 2–8 °C for up to 4 months. * Refer to the corresponding data sheet or CoA to obtain the biological activity. For T cell polarization, the cells should be resuspended in culture medium at 1×10⁶ cells/mL. The cells should be plated at a density of 1×10⁶ cells/cm². Both the dilution and the cell density are important to assure optimal stimulation and cell growth. The following table lists culture plate sizes suitable for different cell numbers. It also indicates the appropriate amount of medium to add. Plate sizes for in vitro T cell polarization. ▲ Note: Refer to "Things to prepare in advance" for conversion from U/mL to ng/mL. Resuspend loaded Anti-Biotin MACSiBead Particles thoroughly and transfer, for example, 40 μL (4×10⁶ loaded Anti-Biotin MACSiBead Particles) per 2×10⁶ cells (bead to cell ratio 2:1) to a suitable tube. ▲ Note: If unloaded MACSiBead Particles shall be used for negative control experiments, replace loaded Anti-Biotin MACSiBead Particles with unloaded Anti-Biotin MACSiBead Particles. Add 1 mL of culture medium to the loaded Anti-Biotin MACSiBead Particles and centrifuge at 300×g for 5 minutes. Aspirate supernatant and resuspend loaded Anti-Biotin MACSiBead Particles in, e.g., 1 mL of fully supplemented T cell medium including the cytokines and antibodies (from CytoBox) to a final concentration of 4×10⁶ Anti-Biotin MACSiBead™ Particles per mL. Determine cell number of freshly isolated mouse naïve CD4+ T cells. 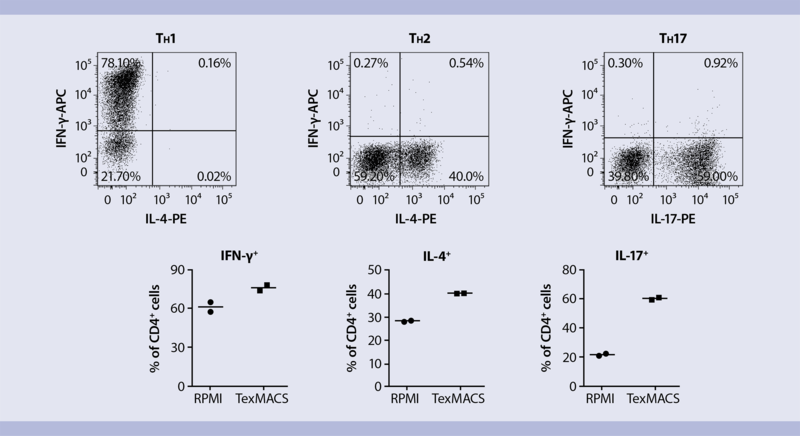 Resuspend cells at a density of 2×10⁶ cells per mL in fully supplemented T cell medium including the cytokines and antibodies (from CytoBox). Transfer the desired amount of cells and the loaded Anti-Biotin MACSiBead Particles from step 4 and 7 at a ratio of 1:1 to a suitable cell culture vessel to a final density of 1×10⁶ cells per mL per cm² with 2 loaded Anti-Biotin MACSiBead Particles per cell (e.g., 2.5×105 cells in 125 µL medium + 125 µl loaded Anti-Biotin MACSiBeads Particles per well of a 96-well plate). ▲ Note: Depending on the cell number to be cultivated and differentiated per well, 6-, 12-, 24- or 48-well plates might be used. Please upscale reagents accordingly and refer to "Plate sizes for in vitro T cell polarization" to choose the appropriate cell culture dish. Incubate at 37 °C and 5–10% CO₂ for up to 6 days. ▲ Note: Inspect cultures daily and add fresh fully supplemented TexMACS Medium if required. At day 2, gently pipette culture up and down to break up all cell clumps. Split the cell culture every two days 1:4 or 1:2, depending on the proliferation of cells, and add fresh fully supplemented TexMACS Medium. After 6 days of cultivation, polarized TH1, TH2 or TH17 cells can be further processed for downstream analysis. Refer to "Intranuclear staining of lineage-specific transcription factors" or "Intracellular staining of lineage-specific effector cytokines". T cells require a restimulation for further expansion or analysis of cytokine expression. See "Restimulation of polarized T cells and brefeldin A treatment" for details. For further flow cytometry analysis, it is recommended to remove the MACSiBead™ particles from the cell suspension. Harvest cells and pool different wells of same condition. Wash empty wells with cold PBE buffer to rinse out the remaining cells on the plate. Wash cells with cold PBE buffer. Resuspend cells in PBE buffer at a density of up to 2×107 cells/mL and vortex thoroughly. Place the tube in the magnetic field of the MACSiMAG™ Separator. Allow the MACSiBead Particles to adhere to the wall of the tube for 4 minutes. Keeping the tube in the magnet, carefully remove the supernatant containing the MACSiBead-depleted cells and place in a new tube. Remove the tube from the separator and add buffer to the same volume as before. Vortex sample, replace tube in the MACSiMAG Separator and repeat steps 7–8. Collected cells can now be further processed as required. To achieve the appropriate working concentration for safe fixation and permeabilization of cells, the Fixation/Permeabilization Solution 1 must be diluted 1:4 with the Fixation/Permeabilization Solution 2 (i.e., for 1×10⁶ cells use 0.25 mL of Fixation/Permeabilization Solution 1 plus 0.75 mL of Fixation/Permeabilization Solution 2). To achieve the appropriate working concentration for safe permeabilization of cells, the 10× Permeabilization Buffer must be diluted 1:10 with deionized or distilled water before use (i.e., 1 mL of 10× Permeabilization Buffer plus 9 mL of deionized/distilled water). ▲ Note: Before dilution, make sure that the buffer does not contain any precipitates. The recommended antibody dilution for all Anti-T-bet, Anti-Gata3 and Anti-RORg(T) conjugates is 1:11 for up to 1×10⁶ cells/100 μL of buffer for labeling of cells and analysis by flow cytometry. Use freshly prepared Fixation and Permeabilization Solution and Permeabilization Buffer from FoxP3 Staining Buffer Set (#130-093-142) for cell fixation and permeabilization. Resuspend up to 1×10⁶ nucleated cells in 1 mL of cold, freshly prepared Fixation/Permeabilization Solution. Mix well and incubate for 30 minutes in the dark in the refrigerator (2−8 °C). Wash cells by adding 1−2 mL of cold buffer per 1×10⁶ cells and centrifuge at 300×g for 5 minutes at 4 °C. Aspirate supernatant completely. Wash cells by adding 1−2 mL of cold 1× Permeabilization Buffer per 1×10⁶ cells and centrifuge at 300×g for 5 minutes at 4 °C. Aspirate supernatant completely. Resuspend up to 1×10⁶ nucleated cells in 100 μL of cold 1× Permeabilization Buffer. ▲ Note: For staining with several antibodies in this step, reduce the volume of 1× Permeabilization Buffer accordingly. For efficient permeabilization, the volume of 1× Permeabilization Buffer should be at least 30% of the overall staining volume. Add 10 μL of each needed transcription factor antibody. Resuspend cell pellet in a suitable amount of buffer for analysis by flow cytometry or fluorescence microscopy. ▲ Note: Due to fixation and permeabilization, cells are smaller than viable cells. Thus, FSC/SSC settings of the flow cytometer may need to be adjusted. Add 20 ng/mL PMA and 1µg/mL Ionomycin to cells and incubate for 3 hours at 37° C.
Add brefeldin A to a final concentration of 2 µg/mL to the cells and incubate for another 2 hours at 37° C.
Harvest cells, determine cell number and proceed to next step. For analysis of TH1 and TH2 cells, use e.g., IFN-γ and IL-4; Anti-IFN-γ-APC,mouse; #130-102-340 and Anti-IL-4-PE, mouse; #130-102-435. For analysis of TH17 cells, use e.g., IFN-γ and IL-17; Anti-IFN-γ-APC, mouse; #130-102-340 and Anti-IL-17A-PE, mouse; #130-102-344). The recommended antibody dilution of Anti-IFN-g-APC,mouse, Anti-IL-4-PE, mouse and Anti-IL-17A-PE, mouse for cell labeling and subsequent flow cytometry analysis is 1:10 for up to 1×10⁶ cells/50 μL of buffer. Volumes given below are for up to 1×10⁶ nucleated cells. When working with fewer than 1×10⁶ cells, use the same volumes as indicated. When working with higher cell numbers, scale up all reagent volumes and total volumes accordingly (e.g., for 2×106 nucleated cells, use twice the volume of all indicated reagent volumes and total volumes). T cells require a restimulation prior to analysis of cytokine expression. After successful restimulation and brefeldin A treatment, intranuclear transcription factor and intracellular cytokine staining can be combined for certain cytokine/transcription factor combinations. In this case, please follow the protocol steps "Restimulation of polarized cells and brefeldin A treatment", "Intracellular staining of lineage-specific effector cytokines", and "Intranuclear staining of lineage-specific transcription factors" in this order. Anti-IL-4 staining cannot be combined with intranuclear staining using the FoxP3 Staining Buffer Set. Use Inside Fix and Inside Perm from Inside Stain Kit (#130-090-477) for cell permeabilization and fixation. Wash up to 1×106 cells by adding 1–2 mL of buffer and centrifuge at 300×g for 10 minutes. Aspirate supernatant completely. (Optional) Stain cell surface antigens that are sensitive to fixation with appropriate antibodies according to the manufacturer's recommendations. Then wash cells by adding 1–2 mL of buffer and centrifuge at 300×g for 10 minutes. Aspirate supernatant completely. Resuspend up to 1×106 cells in 250 μL of buffer. Add 250 μL of Inside Fix (from Inside Stain Kit). Mix well and incubate for 20 minutes in the dark at room temperature. Centrifuge at 300×g for 5 minutes. Aspirate supernatant carefully. Wash cells by adding 1 mL of buffer and centrifuge at 300×g for 5 minutes. Aspirate supernatant carefully. ▲ Note: Fixed cells may be stored in azide containing buffer at 2–8 °C for up to 1 week. (Optional) Stain cell surface antigens that are sensitive to permeabilization with appropriate antibodies. Then wash cells by adding 1–2 mL of buffer and centrifuge at 300×g for 10 minutes. Aspirate supernatant completely. Wash cells by adding 1 mL of Inside Perm (Inside Stain Kit) and centrifuge at 300×g for 5 minutes. Aspirate supernatant carefully. Resuspend cells in 45 μL of Inside Perm. Add 5 μL of the antibody. ▲ Note: For staining with several antibodies in this step, reduce the volume of Inside Perm accordingly. For efficient permeabilization, the volume of Inside Perm should be at least 30% of the overall staining volume. Mix well and incubate for 10 minutes in the dark at room temperature. Wash cells by adding 1 mL of Inside Perm and centrifuge at 300×g for 5 minutes. Aspirate supernatant carefully. Resuspend cell pellet in a suitable amount of buffer for analysis by flow cytometry or fluorescence microscopy. Store cells at 2–8 °C in the dark until analysis. Mix well before flow cytometric acquisition. ▲ Note: Samples may be stored at 2–8 °C in the dark for up to 24 hours. ▲ Note: Do not use propidium iodide (PI) or 7AAD staining. Example of magnetic enrichment of naïve CD4+ TH cells. Naïve CD4+ T cells were isolated from a single-cell suspension, which was prepared from a 6-week-old BALB/c mouse spleen, using the Naive CD4+ T Cell Isolation Kit, mouse. Cell separation was performed either manually with MACS Columns or automatically with the autoMACS® Pro Separator. Cells were fluorescently stained with CD45-VioGreen™, CD4-VioBlue®R, CD62L-PE, CD3ε-APC-Vio®R 770, CD44-FITC, and CD25-APC (all from Miltenyi Biotec) and analyzed by flow cytometry using the MACSQuant® Analyzer 10. Cell debris and dead cells were excluded from the analysis based on scatter signals and propidium iodide fluorescence, and a gate was set on CD45+ cells. The isolated naïve (CD44low/–CD62L+CD25–) CD4+ T cells with a purity of about 98% were used as starting material for in vitro polarization towards TH1, TH2, and TH17 cells. Example of magnetic enrichment of naïve CD4+ TH cells. Naïve CD4+ T cells were isolated from a single-cell suspension, which was prepared from a 6-week-old BALB/c mouse spleen, using the Naive CD4+ T Cell Isolation Kit, mouse. Cell separation was performed either manually with MACS Columns or automatically with the autoMACS Pro Separator. Cells were fluorescently stained with CD45-VioGreen, CD4-VioBlueR, CD62L-PE, CD3ε-APC-VioR 770, CD44-FITC, and CD25-APC (all from Miltenyi Biotec) and analyzed by flow cytometry using the MACSQuant Analyzer 10. Cell debris and dead cells were excluded from the analysis based on scatter signals and propidium iodide fluorescence, and a gate was set on CD45+ cells. The isolated naïve (CD44low/–CD62L+CD25–) CD4+ T cells with a purity of about 98% were used as starting material for in vitro polarization towards TH1, TH2, and TH17 cells. Analysis of lineage-specific transcription factors in TH1, TH2, and TH17 cells. On day 5 of the in vitro culture, the differentiation into the various TH cell subsets was examined by analyzing the expression of the lineage-specific transcription factors T-bet, GATA3, and RORγ(t). To this end, cells were intranuclearly stained with the respective fluorochrome-conjugated antibodies and the FoxP3 Staining Buffer Set (all from Miltenyi Biotec) and analyzed by flow cytometry on the MACSquant Analyzer 10. Analysis of lineage-specific transcription factors in TH1, TH2, and TH17 cells. On day 5 of the in vitro culture, the differentiation into the various TH cell subsets was examined by analyzing the expression of the lineage-specific transcription factors T-bet, GATA3, and RORγ(t). To this end, cells were intranuclearly stained with the respective fluorochrome-conjugated antibodies and the FoxP3 Staining Buffer Set and analyzed by flow cytometry on the MACSQuant Analyzer 10. Analysis of lineage-specific effector cytokines in TH1, TH2, and TH17 cells. (Top) To determine the effector function of T cells after polarization, the capacity of the cells to produce lineage-specific effector cytokines was analyzed by flow cytometry on day 5. To this end, cells were restimulated with PMA/Ionomycin for 5 hours and stained intracellularly for the detection of IFN-γ, IL-4, and IL-17, using the respective fluorochrome-conjugated antibodies in combination with the Inside Stain Kit. In line with the expected characteristic cytokine expression profiles, the TH1 culture showed a high percentage of IFN-γ–producing, but no IL-4–producing cells. The TH2 culture featured a high frequency of IL-4–, but no IFN-γ–expressing cells, whereas the TH17 culture was characterized by a high level of IL-17–producing cells and the absence of IFN-γ–producing cells. (Bottom) TexMACS™ Medium was developed specifically for T cell activation and expansion. In vitro TH cell differentiation in the presence of TexMACS Medium led to a higher expression level of the characteristic effector cytokines in the various TH subsets compared to RPMI 1640. Analysis of lineage-specific effector cytokines in TH1, TH2, and TH17 cells. (Top) To determine the effector function of T cells after polarization, the capacity of the cells to produce lineage-specific effector cytokines was analyzed by flow cytometry on day 5. To this end, cells were restimulated with PMA/Ionomycin for 5 hours and stained intracellularly for the detection of IFN-γ, IL-4, and IL-17, using the respective fluorochrome-conjugated antibodies in combination with the Inside Stain Kit. In line with the expected characteristic cytokine expression profiles, the TH1 culture showed a high percentage of IFN-γ–producing, but no IL-4–producing cells. The TH2 culture featured a high frequency of IL-4–, but no IFN-γ–expressing cells, whereas the TH17 culture was characterized by a high level of IL-17–producing cells and the absence of IFN-γ–producing cells. (Bottom) TexMACS Medium was developed specifically for T cell activation and expansion. In vitro TH cell differentiation in the presence of TexMACS Medium led to a higher expression level of the characteristic effector cytokines in the various TH subsets compared to RPMI 1640.